Did you forget about your beloved pup for Christmas this year? Well fret not, it's not too late to get something on the way for your little (or big) furry sweetheart. It's called the Sniff & Barkens Holiday Toy Bucket and it's packed with five fun toys from Hartz that any pup will love. And once you receive it you can add some extra toys of your own, it's a great place for storage! We already had some Hartz toys that had just been laying around waiting to take their turn with Jave and now they have a fun new home in their Sniff & Barkens bucket. 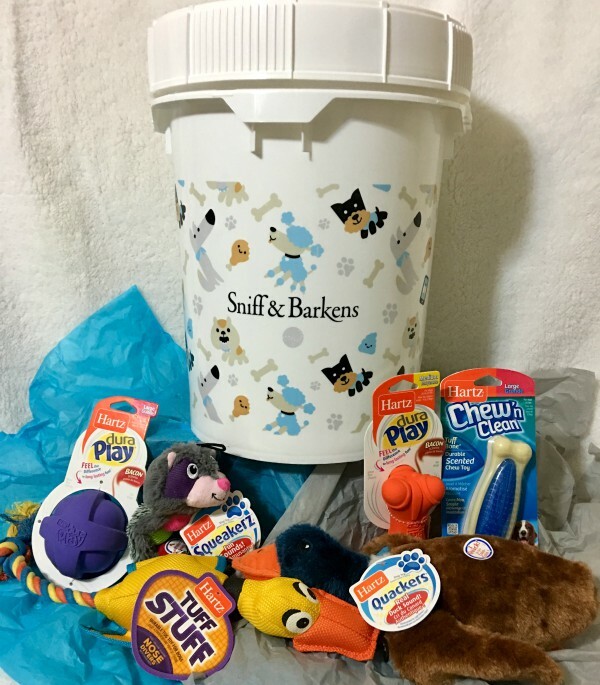 The Barkens Bucket is a bucket full of goodies named for one of the signature dogs in possibly the fastest growing dog-focused social media platform in the last two years: Sniff & Barkens. A portion of the proceeds from each sale will benefit Pilots N Paws, a volunteer organization that connects pilots with other rescue groups to transport dogs in need to safe havens. So really your purchase will be a two fold gift. 1. A gift of toys for your pup and 2. A gift to one or more other pups out there that get rescued from the portion of proceeds of your purchase.